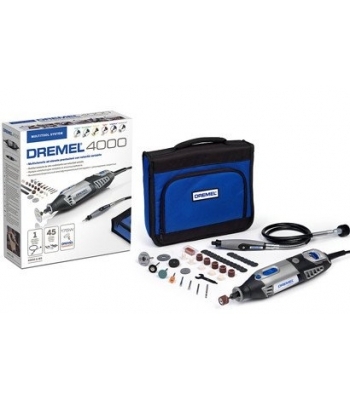 The powerful and precise Dremel 4000 multitool delivers maximum all-round performance. Thanks to it's electronic feedback the tool always delivers maximum force when the job gets tougher. Together with the soft grip and precise speed setting you are in perfect control of every situation. With the innovative EZ Twist Nose Cap there is no need for a wrench to tighten and loosen the collet when changing accessories. the wrench mechanism is integrated in the nose cap of the tool. The collet lock out function prevents you from accidentally blocking the output shaft of the tool. This tool is an absolute must for the most demanding craftsman. The Dremel 4000: maximum all-round performance.